I grew up on the stereotypical midwestern diet of meat and potatoes. In fact, I remember, fondly, having potatoes with almost every meal as a youngster. Thankfully, that menu has not carried over into adulthood - I mean I'm already having enough trouble losing weight, adding potatoes to my meal plan 4-5 times a week would be a hurdle I doubt I could overcome. Regardless, I still love potatoes of all varieties - mashed, scalloped, whipped, baked, fried, broiled, grilled. I'm starting to feel like Bubba Gump talking about all the different variations of how you can serve shrimp, so I'll stop, but you get the point. 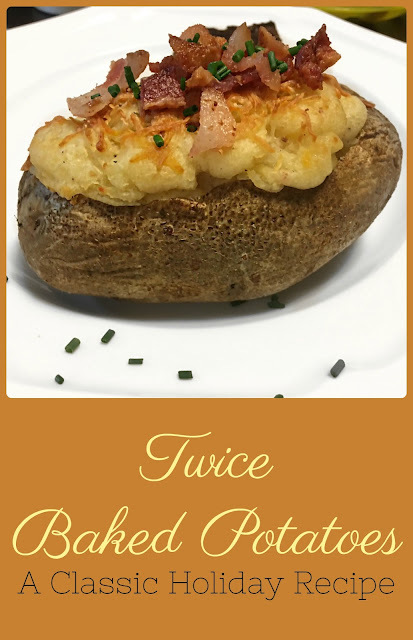 I recently shared my Twice Baked Sweet Potato Recipe which is perfectly portioned because no one else in my family likes sweet potatoes, so it's always a personal treat when I make them. Regular twice baked potatoes, on the other hand, are a family favorite at my house. In fact, almost every year for my husband's birthday they are the one thing he requests. And it wouldn't feel like the holidays if the menu didn't include twice baked potatoes and brussels sprouts - a true sign Christmas has arrived. So this holiday season I want to share with you a recipe you are sure to find served at our house this year and for many, many years into the future. Of course, they will be topped with crispy bacon, cheese, and chives; because yea... bacon. You can hit the gym in the new year, for now, just enjoy! 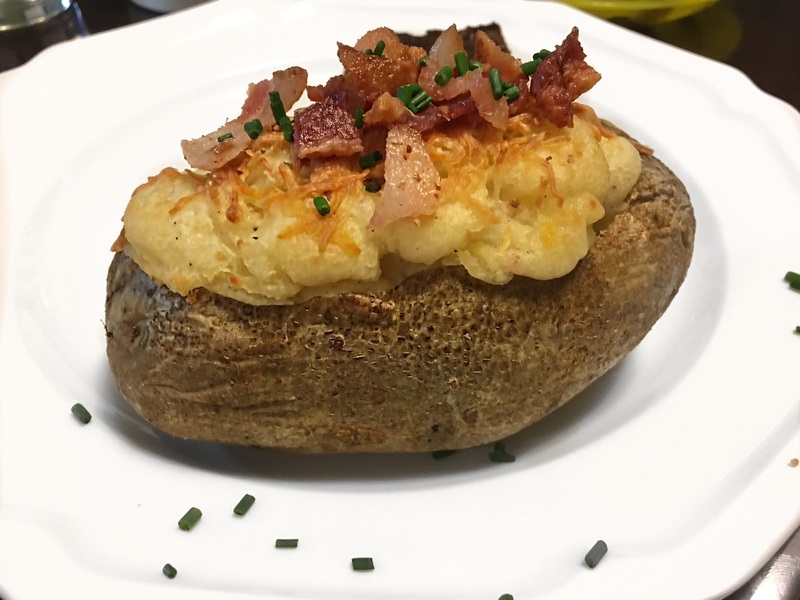 This Twice Baked Potato Recipe is ideal to serve as a side during the holidays, for birthdays, or for those evenings when you want a comforting meal sure to stick to your bones. Preheat the oven to 375 degrees. Wash your potatoes and poke holes along the tops of each one. Bake in the oven for 1 hour or until fork tender. Remove from oven and allow to cool for 5 minutes. Cut an oval shape out of the top of each potato and remove the skin. Then, using a spoon carefully remove the inside of the potato and transfer it to a bowl. Be sure to leave a thin layer of flesh between the skin, about 1/4 inch, so it is not too delicate to handle. Into the bowl with the potato add the milk, sour cream, butter, half the bacon, half of the cheese, and salt and pepper. Mix well. Transfer the potato mixture into a piping bag. You can prepare up until this point ahead of time to make meal prep and entertaining a snap. Change the oven to 350 degrees. Line up the potato skins on a cookie sheet. Pipe the potato mixture into 4 of the potato skins. You'll have 5 potato skins, but I usually make one extra in case a skin is punctured. Allow the potato mixture to overflow out the top of the potato. Cover each potato with the remaining cheese and bacon. Cook for 20-25 minutes, or until hot throughout. Sprinkle with chives and serve. I think I could eat potatoes every day if you made me, but my favorite way to enjoy them is probably twice baked. What are some of your holiday must-haves when it comes to meal planning?